I'm currently reading the First Law trilogy by Joe Abercrombie and I'm very irritated by the lack of maps. No maps at all of the Circle of the World. What gives!? I love maps in real life. I can pore over maps for hours. I even have some historical maps hanging on the wall of my study (and 1 map of Middle Earth in my bedchamber, to the chagrin of my wife). Anyways, this made me realise something. For me, maps in fantasy books are very important. It makes the world come alive better than any other tool. And don't they (in my opinion rightly) say: a picture says more than a thousand words? Do you feel the same way about maps in fantasy books? Do you think maps are important in fantasy books? Also, what is your favorite fantasy map (if any)? I went through a period of consulting maps within books (I can probably still draw the maps of Middle Earth, Wheel of Time and ASoIaF) but these days I don't really care. If there's a map in a book, I'll probably glance at it, move on and won't bother coming back and check where in the world our protagonists currently are. If there isn't, it will not bother me at all. And don't they (in my opinion rightly) say: a picture says more than a thousand words? Well, it is a book, after all . I don't look at them. I also skip poetry. This is pretty much me, too. I'll glance at a map every now and then if I'm confused about geography, and I almost always skip poetry. It rarely makes any sense, and most of the time, it's not very good anyway. I am also a map lover. I think it started with Robert E. Howard's maps of Hyboria. I always look at the maps, and sometimes refer back to them whilst reading, but I'm starting to do this less often. This has coincided with me reading more and more on my kindle. Saying that, I do always bookmark the map. Or when reading a physical book, bend the corner of the map pages so I can easily find them again. I rarely look at maps, but I do love checking them from time to time. Even when the world is well described in the book, it's always nice to have a map as a back up. Plus, if they are well drawn, they are a beautiful addition to the book. 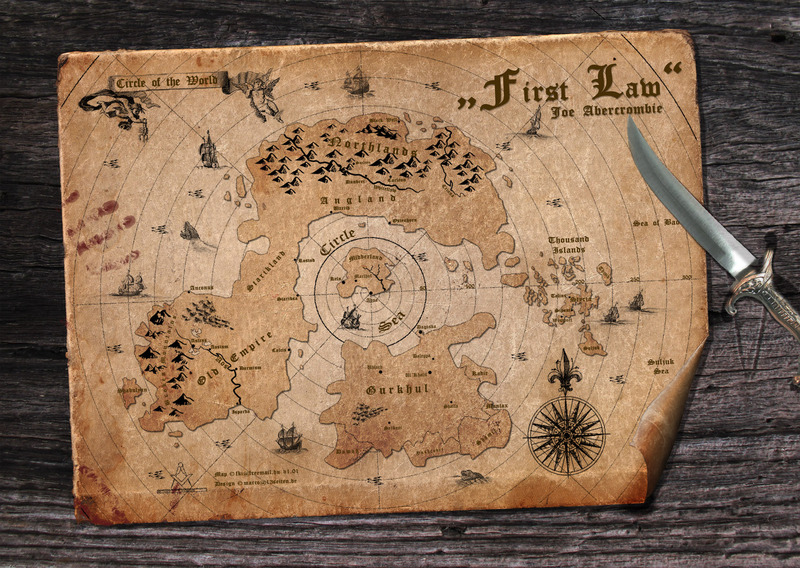 As for Abercrombie, after I finished the First Law trilogy, I found some maps of the Circle online and they turned out to be nothing similar to what I imagined while reading the books, so I wish I had seen them sooner. Aah, I love that map! I almost always skip poetry. But seriously, the use of poetry and songs in fantasy books/series can swing in either of the two following ways: they can be very good and relevant to the story (Keats' poetry in Hyperion comes to mind), but they can also be bad and therefore quite a nuisance. ASOIAF: The Rains of Castamere (Lannister theme song) and the Bear and the Maiden fair. Hyperion: Anything by the original John Keats. I love Keats and have several of his poetry bundles in my book closet. I don't have to know where characters are at any given time, but it is nice to know the lay of the land and the countries relative to each other. Without maps in some series (for example WoT, LOTR and ASOIAF) it would be very difficult to understand why certain things are the way they are. Very often political occurrences and developments can be explained by looking at a map. This holds for the real world (it will for example partly explain the reason for the outbreak of World War 1 and numerous other wars in history) as well as for fantasy worlds (take for example the power struggles between Cairhien and Andor in the WoT). Of course this can also be explained by the text of the book, but nearly not as well as when you combine that text with a clear map. The above is more important in books or series where the focus lies on politics and the dynamics of power (again ASOIAF, WoT and LOTR come to mind), but less so for books or series where this plays a smaller role. I like maps but I definitely skip poetry/songs. I usually ignore the map until the story has characters traveling, then I check the map out. I sometimes check up on the maps, but not all that often. I do read the poetry, although I'm mostly too thick-headed for it (especially Steven Erikson's work). I like maps and do look at them, but I do skip poetry/songs I don't understand poetry and I don't think songs really anything to the story. Perhaps this is something that authors may like to pay attention to. We like maps, but we don't like poetry/songs. Hmmm, the map love is a bit ambiguous though. Half of the respondents don't really care about them. I expected everyone to adore them. My favourite map is from my least favourite Joe Abercrombie book, The Heroes. It's micro scale but suits the book perfectly. I used to think I loved maps. I think they're essential in (certain) history books, for instance--I regularly track down my own maps if a book doesn't supply them and I get a few too many place names I don't recognize. But in fantasy, I've found I don't refer to them: I let the story do what it will with the geography (and it isn't always strictly consistent with the map even when there is one...), and that's usually enough. I find I spend a lot more time looking at map when it's a quest novel. Lord of the Rings, the first Wheel of Time book, Terry Brooks ,etc. I don't care about maps AT ALL. But I never skip poetry. I enjoy trying to decipher meaning in Erikson's poems in Malazan books. I fail every time but I enjoy it nonetheless. /might be relevant that I like poetry and I used to read a lot of Bosnian/Balkan poets. Oh, that's interesting! There's a very high chance that you've read more poets from my country (Bulgaria) than I have.